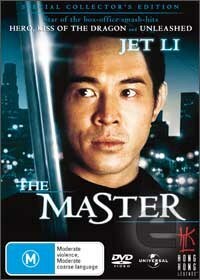 An early vehicle for Jet Li to enter into the US market, The Master is an entertaining action adventure. When a young kung fu champion (Jet Li), arrives in the US to reunite with his former master, he is thrown in the middle of a violent vendetta spearheaded by a blood thirsty ex student. Jet must use his amazing martial arts skills to not only “survive on the brutal streets of Downtown L.A”, but to save Uncle Tak’s honour as well! Those looking for another Hero, Kiss of the Dragon, or Romeo Must Die, might be disappointed – this is b-grade kung fu in all its glory. With all the elements you’d expect – the fish out of water storyline, token love interest, an evil karate school led by an even eviler master, and about as many plot holes as broken limbs, it’s hardly Oscar material. With villains that dress in matching red jackets, green tank tops and can twitch biceps on command, a lot of the pleasure watching The Master comes from laughing at the film, rather than with it. The plot is all about moving toward the next fight scene as quickly as possible - which is fine by me. I don’t need to know the motivation for hiring an assassin to attack Jet on a public bus, but damn is it cool to see Li fight him off and manage to steer the thing at the same time! The less than polished feel of The Master works in Jet Li’s favour. Without digital effects, or wirework, the fight scenes are carried by his remarkable skills. World Kickboxing Campion, Jerry Trimble, features as the key villain, and provides Li with a worthy adversary. The final showdown on the roof of a sky scraper is definitely something worth waiting for! The DVD features a fantastic audio commentary by Bey Logan, a martial arts expert and published author on Hong Kong action cinema. Logan maintains a critical eye throughout – identifying flaws in the plot, highlighting, explaining and dissecting elements of the film, and framing The Master within the career of Li. It adds an extra element to The Master – on its own an entertaining, run of the mill showcase of Jet Li’s remarkable ability; but with aid of Logan, also a critical look at Hong Kong action cinema.